LAV is in the Air! LAVender that is! 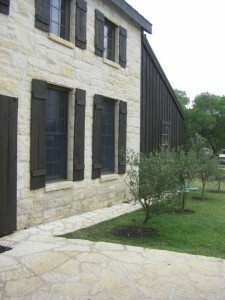 The Texas Hill Country (Fredericksburg specifically) is home to great scenery, a relaxing environment, excellent vineyards, peach orchards, antique shopping, bed and breakfasts galore, and much more. It is such a delight to visit this great town. 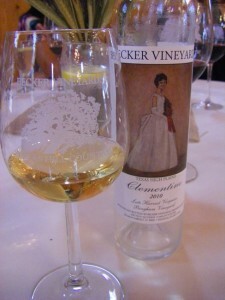 I had the pleasure of attending the Lavender Festival at Becker Vineyards on Sunday afternoon. 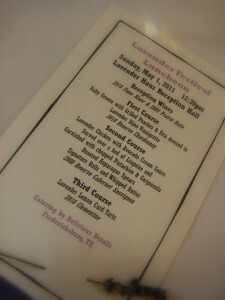 I attended the luncheon and enjoyed a delightful array of lavender gastronomy. 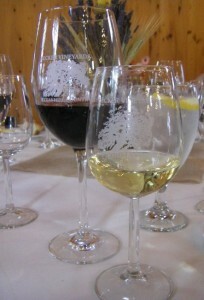 We started off the luncheon with a wine reception on the patio and enjoyed the 2010 Fume Blanc (aka Sauvignon Blanc) and the 2009 Priarie Rotie (Rhone blend). I’m a huge Sauvignon Blanc fan (it’s so refreshing in the TX Summer Heat)! The Fume Blanc we enjoyed was aged in oak barrel as well as stainless steel. Since I’m a lover of Marlborough (New Zealand) Sauvignon Blanc (lots of grapefruit, herbs, and all around citrus flavors as well as seeing only stainless steel and no oak), the Becker Fume Blanc did not bode well on my palate. My palate prefers an unoaked version of this varietal. I am a fan of red blends, so the Prairie Rotie was a very nice treat. Interruption: ever heard that saying “don’t like the weather in TX? Just wait five minutes?” Well, this day was a true expression of this statement. We enjoyed the patio air at a nice 86 degrees before the reception. Keep reading to find out the weather after the luncheon…. We then ventured inside for our gastronomic affair. 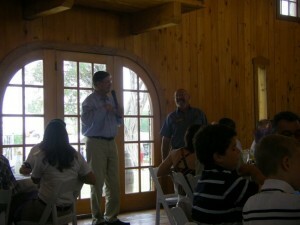 Dr. Richard Becker gave a quick introduction and the dining commenced. The first course was a green salad with peaches, feta and a lavender dijon vinaigrette paired with the 2010 Reserve Chardonnay. This was a delightful combination with the oaky, supple components of the Chardonnay cutting the acidity of the vinaigrette. The dressing was divine – and I’m convinced I will replicate it one of these days (that, or have my lovely friend, the Ceci Sipper do so)! The second course was a lavender chicken with avocado cream sauce served with a bed of linguine and asparagus paired with the 2008 Reserve Cabernet Sauvignon. Who says you can’t have red with Chicken and a cream-based sauce? This is a fine example of great food/wine pairing that may seem a bit unconventional to some folks. 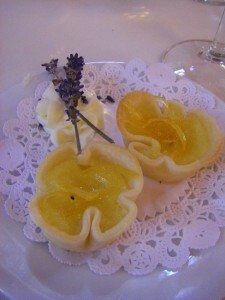 The third course was a lavender lemon curd tart paired with 2010 Clementine (Late Harvest Viognier). As you can probably presume from my above statement, my palate favors anything citrus! This dessert was delightful, and extremely tart. The honey-like sweetness of the Clementine balanced extremely well with this dish. Overall, the food was delectable and the ambiance superb. Being at Becker transcends you to the world of Provence, with the vines, the lavender fields and the quaint architecture of the South France. The hospitality was great, and once I departed the building, I was confronted with a cool, 58 degree breeze!! Of course I would be remiss if I failed to mentioned attire in this post! 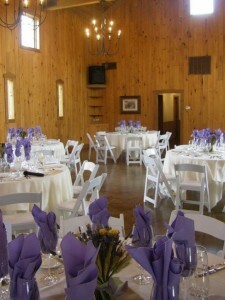 Since I don’t have a lot of lavender options in my wardrobe, I chose a color reminiscent of the Fredericksburg peaches – a bright sundress that was great going into the luncheon, and had me freezing on the way out! None-the-less, it was an enjoyable afternoon centered around wine and food (hmmmm, maybe next year, we can get a little fashion show going on with all things lavendar!). 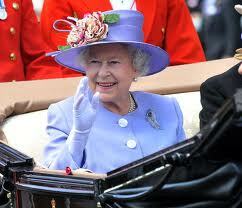 And since we just had a royal wedding (and I think more Americans should wear hats), I bet the Queen would arrive to this luncheon in something like this. 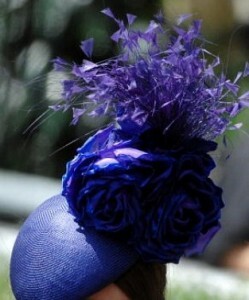 I might opt for a hat like this. 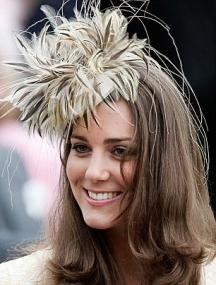 And, I really love this one worn by the now Duchess of Cambridge and it would look great with my red hair! P.S. 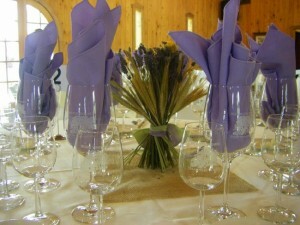 If this post has you anxious to attend next year’s Lavendar Luncheon – you’re in luck! There is one more luncheon offered on Sunday, May 8th – Mother’s Day! Details here. Previous Previous post: Vinously Chic in the Vineyard! 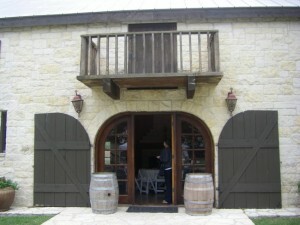 Next Next post: Join me at this week’s San Antonio Wine Tastings!